A few years ago, I got on a Wes Anderson kick. I practically watched his entire filmography to that point in one long binge-worthy day. After catching up, I felt I truly appreciated his quirky, orthogonal cinematography and deeply complex characters. I’ve essentially been a fan of his since Moonrise Kingdom (2012), so I was looking forward to his latest work, Isle of Dogs(2018). After all, he had proven his skill at stop-motion animation with The Fantastic Mr. Fox (2009) and had received nominations for Best Picture and Best Director for The Grand Budapest Hotel (2014) since then. Unfortunately, while Isle of Dogs carries Anderson’s distinct style and charm, it felt a little watered down. Sure, the shots were full of their beauty and symmetry, and the story had its cute moments, but it mostly felt like he was on autopilot. Maybe the PG-13 rating was holding him back? I don’t know. In most fiction, there is a suspension of disbelief, but setting this film 20 years in the future while still holding to the aesthetic of the antique (I doubt there will be nearly that many reel-to-reels in the future) seemed to backfire a little. I’ll give Wes Anderson some credit, though: he did try something new by including the “language barrier” and adopting the Japanese style as much as he could. It also seems that stop-motion techniques have improved significantly since The Fantastic Mr. Fox, likely due to many of the same 3-D printing technologies used for Kubo and the Two Strings (2016). 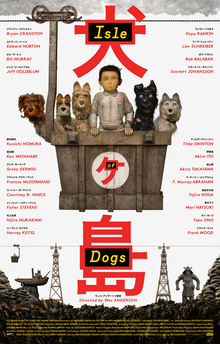 The mixture of 3-D stop-motion and 2-D animation in Isle of Dogs should also be commended. In the end, I think my main qualm with this film was that it was a smidge too predictable. Perhaps this was due to the standard McGuffin of the boy trying to be reunited with his dog. Full of Wes Anderson’s charming cinematography but not too much else, I give Isle of Dogs 3.5 stars out of 5.